i am just starting to fixture my E85 setup. doing my research within this excellent Section i am struck by all the fuel system contortions. multiple multiple pumps sumps etc. admittedly i have over-engineered a few things in the past but i have gained (some) religion. i am looking for 600 max SAE hp. RXTASY7 is making between 6 and 700 on 4 2K injectors.... good enough for me. let's assume they actually put out 2200 per so we have 8800CC. 6500 CC is 390 liters per hour. it may be that RXTASYS7's rail pressure is up a bit so he is using more fuel but keep in mind flow only rises w the square root of the increase. for instance going from 43.5 to 60, a 38% pressure increase adds only 17% more flow. both pumps are pretty close to drop in, work w E85, and are Amp friendly. the Kenne Bell works only in boost so you don't have huge amounts of fuel re-cycling thru your system. simple, cheap. sign me up. Hey Howard. I am running 4 Bar base pressure. Also, here is some documentation that might help you. Simple to me would be dual pumps and done. I don't understand the appeal of the BAP it is IMO a band-aid for too small of a pump. Personally I would use dual 044 in the CJ hangar for what you are doing and call it a day. Run some heavy gauge wire and quality relays for power along with parallel fuel lines and have a good proven reliable setup. There are plenty of people running the dual fuel pump setups on many different engine and platform across the automotive industry and do not have a problem with fuel density. So stop worrying about it. 2-Bosch 044's with heavy duty fuses, wiring, relays, and 60 PSI base pressure. i think there is only one "intank pump" capable of this HP target, that is the walbro 316 aka 360 aka e85 walbr400. Also there is nothing wrong with a boost a pump, particularly using it to boost voltage only when needed. There is another better version of the BAP made by JMS i believe. the purpose of my post was to simply offer another option for consideration. i am not suggesting it is better than other setups but it looks like it will work for my needs. i have used a KB Boost A Pump since 2004 and consider it a simple install and i like that it only works when you need it. i ran a Denso pump on the BAP at a 20% Volt gain for 8 years and the pump was fine w the increased voltage. a combo of the Walbro E85 pump ( PN 9000267) and 17.5 Volts under boost can do 517 liters per hour which is more than enough to meet my needs. MSD makes a variation on the BAP but a vacuum line needs to connect to the module meaning it must be situated within the engine compartment. Kenne Bell supplies a small pressure diaphragm that functions as a boost switch and two wires communicate w the module that i have located in the pass side compartment w my battery. i have a Walbro E85 on the way. Last edited by Howard Coleman CPR; 09-16-13 at 06:11 AM. howard, will you still run AI after switching to E85? If yes, what mix and how much injection? "will you still run AI after switching to E85? If yes, what mix and how much injection?" first off, let me say that there is no one fuel solution for us... we all want to do different things. my objective is to have a gas/AI map which i will run on the street probably off the spring as the car flies at 14-15 psi and i do like to drive my car on the street. further, E85 is only spottily available in wisconsin and the last thing i want is to be hoping to find E85 as i watch my fuel needle quickly dropping to zero. running 93 pump the engine absolutely needs AI. i run 25% distilled water and 75% methanol. about 1000 CC meth and 333 CC water. Beyond Redline is currently installing a FFS and in order to interpolate between gasoline w AI and E85 the AI needs to be a constant. a bit of meth and water will further make the engine happy. the primary reason i am installing the FFS is so that when i get a tank of E85 and it is E70 or E60 the fuel/ign maps will make the adjustment. Luke says the primary reason for E85 engine failures is the 85 part of the equation is not always 85.
i do need to find out what pressure the relief valve in the pump opens before we raise rail pressure.... anyone have that info? i am really happy my V88 will do the math on the FFS. at the time i bought it i wasn't even thinking about it. I'm currently also thinking about switiching to E85 for my project, I already have 2x1000ID's primary and 2x2000ID's secondary, upgrading to an exzessive manifold is on the list anyways and cjm will exchange my 2port secondary rail to the 4port rail for a very good deal. I then just need 2 additional ID2000 + suitable pump(s). But I also have bought an aquamist hfs3 + summer module. -> Therefore I was also thinking about using a FFS with my Ps2000 and trigger the AI only when I'm running on, lets say < E70. I'm just a little bit afraid of the amount of fluid packaged into the combustion chamber. We just tuned a car with a P1000 and FFS. Very easy. Haltech did a good job with the conversion map. We tuned to very low 11s on pump gas and adjusted the FF map to run mid 11s afr. Well worth the money and effort. Thinking about running a FFS on the drag car just to see what the fuel ratio is. Not to make any adjustments. Im aware you are a very knowledgeable guy- but what is the application? I think when you are running critical levels of boost and tune insuring there is no fuel starvation is key- any plans for a sump or surge tank? ^ All he wants to do is go 200MPH in 1 mile. I still don't understand the logic behind most of what HC does. Simple is a CJ hanger and some fuel lines. Over complicating things like always. I test my E85 everytime I get it....never has been below 85% ethanol, even in the Winter. I had WI and figured it was just another point of failure, so I ditched it. Just run a system that is tried and proven to work. 2-Bosch 044's with a sump and 4-ID2000 injectors. A good EMS helps too and a FFE trigger. I went through my first walbro E85 pump. Failed after about 1k miles. However, I believe it was my electrical system that caused the failure as the pump was only seeing around 9.5 volts at the pump. Moral of the story double check the voltage at the pump during installation. Quick follow-up to my previous post. Problem wasn't the pump (this of course after I already installed the new one). Ended up being a relay **** the bed. Still scratching my head as to how it was seeing voltage with a bad relay. Voltage jumping from the positive side of the coil to the out pin in the relay, maybe? Same happened to me this past winter. 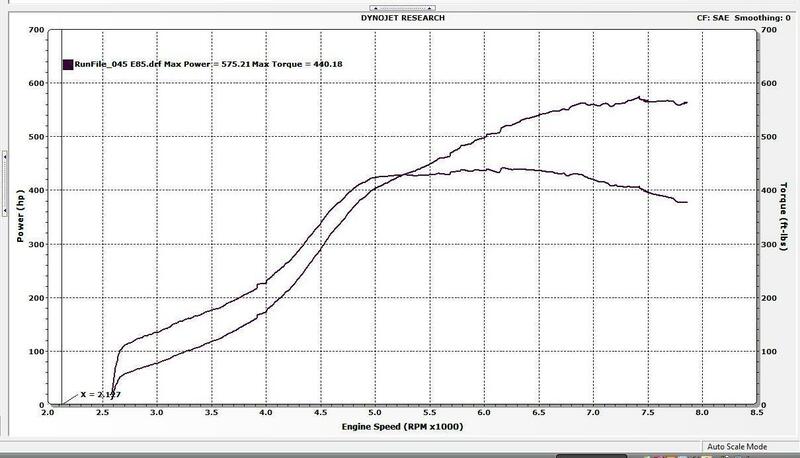 Reviewed a log where A/F's were low to mid 13's (Gas Converted) doing a freeway pull, 3rd all the way through 4th, at 23psi 550whp+. Finally figured out a relay died for one of the pump in the surge tank. Engine is still perfect! Thank you E85. Only high quality Bosch relays for now on. we were able to spend a day on the rollers and it proved to be fruitful. i now have a Flex Fuel Sensor (FFS) in my system w a bunch of the usual fuel upgrades... 8800 CC of injector, the Walbro E85 pump being run by my beloved Kenne Bell Boost A Pump, dash 8 fuel lines etc. all seems to be well. we ran on straight E85 yesterday and i was blown away by how much midrange power the motor made.... 402 at 5000! 448 at 5500! 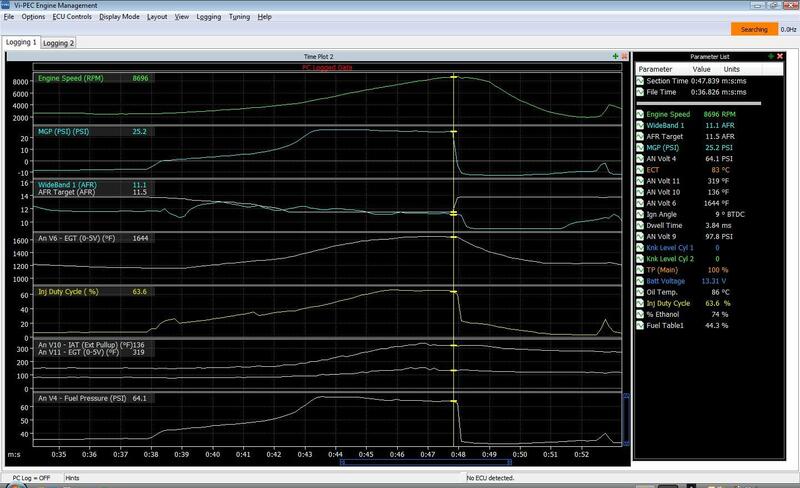 the dyno lost RPM signal where the sheet ends but we ran most pulls to around 8800.
i was running my GT4094r at around 25- 26 psi. we made 575 which is about right for that boost. the 4094 makes max air at 29 psi which after we shuffle a few things we will visit. i am entered in the Texas Mile in late Oct.
LOVE THE V88! still scratching the surface and having a ball. Anyone know if the Apexi GTR pump will work with E85? Im assuming not since it is older and designed to run gasoline, but I thought Id check. it works, we had one in a R34 GTR here at Full-Race to fill a surgetank with dual 044's. keep in mind E85 needs a lot of flow so really you would need 2 of them... the walbro 400 E85 pump is a much better choice !